Are you new to electronic cigarettes or, perhaps, are already a fan of ecigs but want a better brand that will last longer, give a better vaping experience and offer more flavors? Whatever your reason is, electronic cigarettes have exploded in popularity with many brands, hardware solutions and flavors made available. Use our reviews and comparisons below to help yourself find the best e-cigarette on the market today. Of course, people have preferences just like they do with regular cigarettes, so we’ve listed the top choices and show you what’s great and unique about each company. These ratings and comparisons are based on electronic cigarette rechargeable kits and products sold in a bundle. Our comparison also takes a look at the choices, flavor options and more. Each company below has a full review that we’ve completed here at Top Five Advisor that you can click for a full breakdown of all products and various options available. Trying to reduce or quit your smoking addition? Be sure to look for an e-cig company that offers varying levels of nicotine. One trick we’ve used to help others reduce the desire is to reorder with lower and lower nicotine levels. You’ll barely notice the difference and you might even be able to totally quit the habit over time (no guarantee, your individual results may vary). Halo Triton Tank Starter Kits - #1 Diamond Award! Options for beginners and vaping experts. Triton kit includes 2 650mAh batteries, 2 tanks, USB & wall charger and a case. Triton users can choose from 25 American-made & bottled flavors. G6 kits are cig-a-like, sleek and stylish for those wanting the cigarette experience. G6 kits include 2 batteries, 5-pack cartomizer, USB & Wall charger and case. G6 users can order blank cartomizers and mini tanks to use e-liquid. $5.99 7ML, $19.99 30ML and $24.99 sampler packs available. We advise ordering the newer Triton Tank system that Halo now offers. The two batteries you will receive will last far longer compared to the G2 kits. You will have a choice of 11 different colors and are all very easy to use and maintain. The new Triton technology includes a new Leak Shield that will prevent the liquid from leaking out, a serious problem we’ve experienced with other test kits we’ve received. Try not to be overwhelmed with the photos, the Triton is very easy to use. Charge up your batteries, fill the clearomizer tank, screw them together and you are ready to vape. Another reason we love the Triton is you’ll be able to take advantage of Halo’s award winning premium e-liquid flavors that are prepared and bottled in Florida, USA. Choose from 25 different flavors or order their $24.99 sample packs that will allow you to try their various flavors. Nicotine options – During your order, select from no nicotine all the way to 24mg/ml extra high nicotine levels. There’s 5 nicotine levels to choose from in total that range from 0-24mg. We love these options because if you are trying to reduce your nicotine addition from traditional smoking, you can reorder with lower and lower nicotine levels and ween yourself off over a long period of time. Raising industry standards since 2009. Halo Ecigs feature child-proof safety caps, cobalt blue bottles to protect flavor, FEMA/GRAD approved food additives, best by date on each bottle and they staff professional chemists that are involved with the main phase of production. Kit includes 2 tanks, USB charger, wall charger and 2 batteries. Hardware Warranty: You may return your Halo brand hardware for a full exchange or refund within 30 days of receipt. Want massive amounts of vapor? Go V2 Pro. 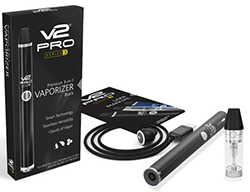 V2 Pro Series 3 Kit includes a vaporizer, liquid cartridge and USB charger. 3 colors to choose from with car & wall adapter sold separately. Capable of loose leaf and wax vaping (cartridges sold separately, $24.99). Upgrade to series 7 for a HUGE battery and option for Wax vaping at 600°C! 12 E-Liquid Flavors in 5 nicotine strengths (including zero). $16.95 25ML, $29.95 50ML, $29.95 sampler packs. We guarantee, if you visit V2’s website, you are going to get overwhelmed. Their main starter kits page has 8 kits to choose from and as you start comparing and contrasting the differences, you’ll notice the tab at the top of their page that offers V2 Pro and Vapor Couture, all subsections that have even more starter kits, accessories and … enough choice to make you rage quit and order another carton of regular cigarettes from 7-11. What are these guys thinking? We’re not sure, all we know for sure is they definitely don’t subscribe to the K.I.S.S. (Keep It Simple, Stupid) principles of Internet marketing and sales. Regardless, if you want the latest in technology and the best experience that V2 offers, jump right to the V2 Pro tab and look at the Series 3 Advanced 3-in-1 vaporizer. We’re here to save you money and time. Yes, the V2 Pro is more expensive, but if you order a standard kit, eventually, you’ll be ordering a V2 Pro Series 3. Skip that introductory investment and get their best. The Series 3 Pro: Your ecig will come with capability to use e-liquid, loose leaf and wax for your vaping needs. If you want to vape with loose leaf or wax, you will need to buy an additional cartridge for $24.99. This pen will produce massive clouds of satisfying vapor with each puff. The battery size is 350 mAh for the Series 3 and if you choose to upgrade to the Series 7, you’ll get a massive 1,800 mAh battery that will last through a massive amount of puffs. Your V2 Pro includes smart technology that detects the type of cartridge and warms to the optimal temperature for wax, loose leaf or e-liquid. You will also enjoy the magnetic charging cord that comes standard with all pro pens they offer. Nicotine Options: Choose from 5 strengths that include Zero, 0.6%, 1.2%, 1.8% and 2.4%. For the traditional smoker that wants a cig-a-like. Lifetime hardware warranty. 30 day money back guarantee. Looks just like a regular cigarette. 10 cartridge flavors to choose from. The first two companies we’ve listed above are excellent choices but may be a bit too costly for the person who is just starting out. We chose EverSmoke as the gold award winner at Top Five Adviser because of the low cost and for the traditional look that many are looking for. Nicotine Options – There are 5 nicotine strengths to choose from. None, 6mg, 12mg, 18mg and 24mg. Flavor Cartridges – You can choose between 10 flavors. They offer a 10 pack flavor sampler that offers all 10 flavors for $26.60. Otherwise, order a single flavor with 15 cartridges for $39.99. Your EverSmoke Starter Kit will include 1 high-capacity battery, 1 standard battery, 1 wall charger, 1 USB charger, 5 cartridges and a manual. The above $15.99 kit is a limited time offer. This kit has a regular price of $49.99. If you notice the offer is no longer available, please let us know so we can update this section for future readers. Save 20% on all starter kits. Kit includes 1,300 variable mAh battery, tank, 6 atomizers, wall & USB charger. $15.99 30ml bottles with loads of flavors including custom blending options. Your kit will include a variable voltage battery with 1,300mAh power, 1 thunder tank, 6 atomizers, a wall charger, a USB charger and an instruction manual to help you use your new kit. We’ve reviewed 5 other electronic cigarette companies that may have a package that you are interested in. Even though they didn’t make our best of the best list, we recognize that our choices may not be the best for everyone. 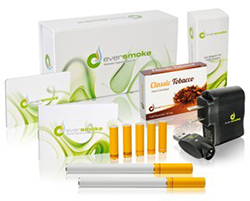 See our full in-depth reviews of the following companies to see if they have an ecig starter kit that’s right for you. White Cloud Electronic Cigarettes Review – Offers 20+ USA-made flavors in unrefillable cartridges. The Cirrus 3 starter kit is their most popular for $69.95. 6 nicotine flavors. Shipping is $6.95. If you are looking for a disposable solution, order their Fling variety which offers 5 nicotine strengths. One unique feature they have is their invisi-vapor cartridges that produce minimal vapor for areas where being discreet is important. Apollo Ecigs Review – Their latest kit is the VTube V4.0 Kit sold for $139.95 that offers their latest technology including a variable wattage vaporizer from 5-50 watts. Kit includes their Phazer Sub-Ohm tank, a dual charger and includes a 30ml bottle of e-liquid. If that package is too pricey, check out their Valiant Kit for $49.95 that includes a 1,300 mAh battery, 10ml bottle e-liquid, USB charger and variable voltage setting. Check out their massive made in the USA selection of E-liquids to choose from that include tobacco, menthol, fruit, drink, dessert and specialty flavors. Vista Vapors Review – Offers a wide range of starter kits for beginner and professional electronic cigarette users. These aren’t your standard kits with everything included, you’ll have a wide selection of branded vaporizers that we’d compare to walking into a local vape shop. Vista Vapors offers the largest selection of flavors to choose from with a staggering 180+ flavors. Vista Vapors is focused on being your choice for e-liquid. Prices start at $4.99 for 17ml. Order a massive 102ml bottle for just $16.99. Top Five Advisor highly recommends using Vista Vapors for your e-liquid needs. Volcano Electronic Cigarettes Review – A massive selection of starter kits to choose from. Check out their Lavatube 3 starter kit for $194.99, their PELE starter kit (Hawaiian-made) for $199.99 and their Tephra 2 starter kit for $99.99 for our choices for the best ecig experience. Besides their kits, they also have a large line of e-liquids sold in 15ml ($12.99) and 30ml ($19.99) bottles. Try their 4-bottle sample packs for $31.99 which allows choosing your own or random. SmokeTip Review – SmokeTip used to be a bland ecig company that just offered a cig-a-like cartridge-only variety. Now they offer the MiniTank, SmokeTank, SmokeTankXL and MegaTank ecig that will suit your e-liquid vaping needs. The MiniTank kit is $69 and it includes the vaporizer, 2 lithium batteries, 2 atomizers, 1 wall & USB charger, and a 12ML bottle of e-liquid. For your comparison, the largest MegaTank Kit is $99. Their e-liquids start at $9.95 each for 12ML. Order in bulk and save, 15 bottles is $8.45 each. They offer 5 nicotine strengths from 0 to 24mg.